Until recently, I knew nothing about the phenomenon commonly known as a Brocken Spectre. My good friend Bryn Layton had the good fortune (and skill) to photograph one and I was immediately fascinated. The “spectre” is created under particular atmospheric conditions. 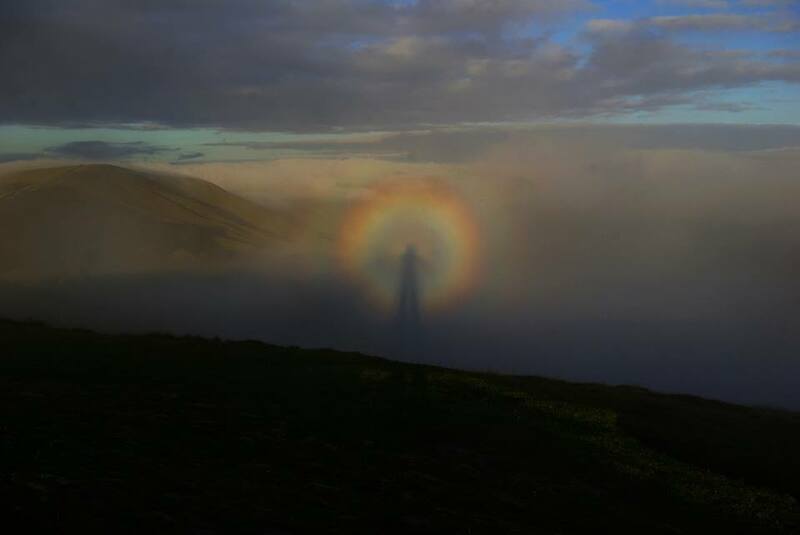 The ghostly outline of a person is reflected onto low cloud or fog when they are stood infront of the sun on a high ridge or mountain. In this case, at 8am on Mam Tor in the Peak District in the UK. Once explained, the circumstances seem a little mundane but the effect is nonetheless spectacular. The halo around Bryn’s reflection is reminiscent of a religious icon and makes you ponder the origin of such imagery. Would our ancient ancestors have perceived their own reflection or would they have seen something uncanny; a being from another world or even a god?